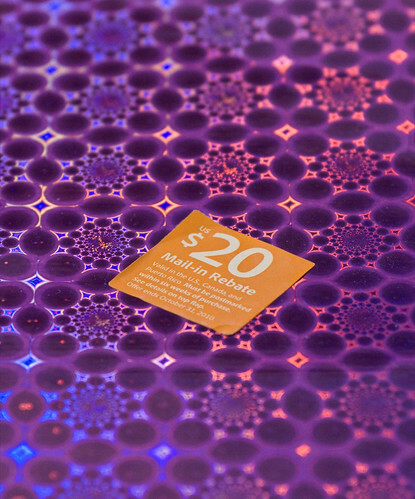 I think mail-in rebates are a pretty brilliant idea – for the company, anyway. According to most reports I’ve read, the majority of them are never filled out, which means the company keeps the money. Let’s spell that out in a real world example. The last time I traded in my cell phone, the store was loaded with phones. Many of them had prices you might expect – $199 without a new contract, $49 with a new contract, $0 after a $50 mail-in rebate. Unsurprisingly, it was the $0 that was marked in bold with enormous lettering. If you were to fill fill out the rebate form and return it in time, you’ll get a $50 check back in the mail. That’s a good thing. However, the reality is that most rebates are never mailed in. Redemption rate statistics vary, but some redemption statistics indicate the return rate may be as low as 5%. My speculation is that it’s higher than that, but it’s still well below 50%. On top of that, there’s also slippage, where people receive rebate checks but forget to cash them. This accounts for an additional small percentage of rebates that the company gets to keep. Adding these together, it’s no wonder that companies love to offer rebates because it provides the illusion of lower prices while not actually costing the company nearly that much. The easiest method of protecting yourself is if you get a rebate form, fill it out and mail it immediately when you get home. Don’t put it off for even a moment. This should be the first thing you do when you return home after receiving a rebate form. This mostly just comes down to task management. I’m a big believer in the idea that almost all tasks are easily sorted into one of four groups: important and urgent, important and not urgent, not important and urgent, and not important and not urgent. This is a useful idea that comes from Stephen Covey’s books. For example, an urgent but not important task might be a phone call. It’s urgent because your phone is ringing and demanding attention, but it’s not really important. On the other hand, returning a large rebate form is important but not urgent. You don’t have to do it today, so it’s easy to put it off. One of the big challenges in time management is that people substitute urgent for important. They’re more likely to pick up the phone than to fill out the rebate form, even though the rebate form is more important in the long run. That phone call happens to be urgent, and urgent wins the prize. The thing is, urgency is really only useful in comparing things of the same importance. If you have a rebate form due in sixty days and one due in thirty days, the one due in thirty days is more urgent and should be filled out first. If you compare most tasks to a random phone call, though, most tasks should win. Rebate forms are a perfect example of this. Because they’re not urgent, people often put them aside to deal with urgent things, even if the urgent things are far less important. Don’t make that mistake. It will cost you money with the rebate forms, and it will cost you in other aspects of life as well.